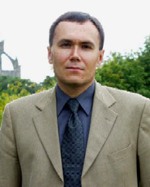 Professor Igor Guz is Head of School of Engineering at the University of Aberdeen. He joined the University of Aberdeen in September 2002 as a Lecturer and was promoted to Senior Lecturer in August 2003, to Reader in June 2005, to personal Chair in Engineering in August 2007, and to established Sixth Century Chair in Solid Mechanics in February 2010. Prior to joining the University of Aberdeen, Professor Guz worked at various research/visiting positions in the Timoshenko Institute of Mechanics, Kiev, Ukraine (1991-1998), Institute of Materials and Machine Mechanics, Bratislava, Slovakia (1991, 1992), Vienna University of Technology, Institute of Lightweight Structures and Aerospace Engineering, Austria (1993), University of Cambridge, Department of Engineering, (1994, 1995, 1996-1997), University of Stuttgart, Institute for Computer Applications, Germany (1994-1996), Imperial College London, Department of Aeronautics (1998-2002), University of Paderborn, Laboratory for Technical Mechanics, Germany (2002). In 1994, Professor Guz received the Doctor of Sciences (DSc) degree for the work entitled “Three-dimensional stability theory of composites with various intercomponent conditions”. In 1995, he was awarded the Prize of the Academia Europaea, and in 2009, The State Prize of Ukraine in Science and Technology. He was also a recipient of the Research Fellowships of the Alexander von Humboldt Foundation (1994-1996, 2002), the Research Fellowships of the Royal Society (1994, 1996-1997), Lise Meitner Research Fellowship of the Austrian Science Foundation (1997) and the Research Fellowship of the President of Ukraine (1994). In 2004, Professor Guz founded the inter-disciplinary Centre for Micro- and Nanomechanics (CEMINACS) in Aberdeen. Professor Guz's research work has appeared in more than 300 publications including 4 books and over 130 journal papers (29 journal papers are the solo contributions). He has been reviewing papers for over a dozen international journals. One of his recent papers (International Applied Mechanics, 2003, 39(7), pp.797-801) has been placed in the top 1% within its field according to Essential Science Indicators. Another paper (Composites Part A, 2007, 38(4), pp.1234-1250) was the most downloaded article of the journal in January - March 2007 according to Top25 Hottest Articles and remained on the list for eighteen months. He made over 60 technical presentations at international conferences and gave over 30 invited talks at leading universities in the UK, USA, Australia, Germany, Denmark, Austria, Slovakia and Ukraine. Professor Guz was also organiser and Co-chairman of the Euromech Colloquium 400 "Impact and Damage Tolerance Modelling of Composite Materials and Structures" (27-29 September, 1999, London) and chaired technical sessions at the Third International Congress on Industrial and Applied Mathematics (Hamburg, Germany, 1995); the Euromech Colloquium 402 "Micromechanics of Fracture Processes" (Seeheim, Germany, 1999); the First MIT Conference on Computational Fluid and Solid Mechanics (Cambridge, USA, 2001); Deformation and Fracture of Composites Conference (DFC9), Sheffield, UK, 2007; the 2nd International Conference on Advanced Computational Engineering and Experimenting (ACE-X 2008), Barcelona, Spain, 2008; the 7th EUROMECH Solid Mechanics Conference (ESMC2009), Lisbon, Portugal, 2009; and the 18th International Conference on Composite Materials (ICCM18), Jeju, Korea, 2011.